1. Monitor can be locked via a 1/4’’ screw manually and locked tighter with a hex spanner. 2. The structure is very compact and it supports monitor up to 1.5kg. 3. Rotation axis enables to adjust the position of monitor up to 180° for better monitoring, and it enables to fold the monitor for storage and transportation. 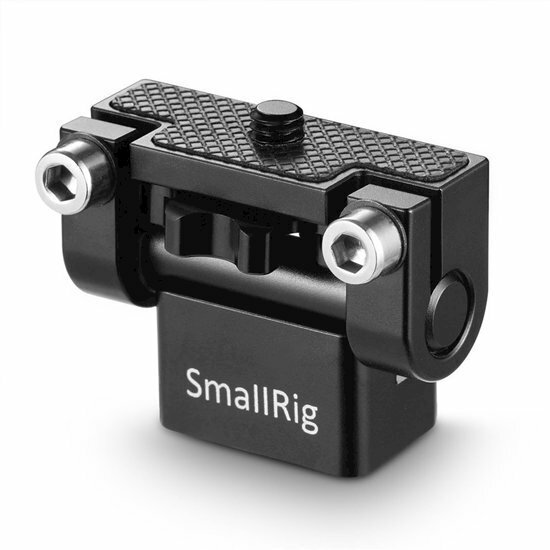 SmallRig DSLR Monitor Holder Mount 1842 is designed to mount monitor to camera via a 1/4’’ screw, which can be operated with fingers and tightened more with hex spanner. It could attach GH5 Cage 2049/GH4 Cage 1585/Sony A6300 Cage 1661 via two 1/4’’ counterbore screws on counterbored slots. Rubber cushion on the top is utilized to prevent the monitor from any scratches and damages. Rotation axis enables to adjust the position of monitor for better monitoring as per your needs at different directions during shooting, and it enables to fold the monitor for storage and transportation. Two M5 screws are applied for damping based on the weight of monitors.